Exact delivery services available are indicated on every product page. FREE Next Working Day Delivery is available on goods ordered before 10am, 11am, 12pm, 2pm, 2:30pm, 3pm, 4pm, 4:30pm or 5pm (depending on the product) on a working day (a working day is a day other than weekends and bank/public holidays) and providing no additional security checks are required and the goods are available. Offshore/Remote deliveries will be despatched immediately, however the actual delivery time will vary depending on the location. Free 2-4 Working Days Delivery is available for larger products which have to be palleted. Express Next Day Delivery is available on most of these products. Please Call 01539 760650 for more information and additional costs. Free 2-3 Working Days Delivery is available for larger products which have to be palleted. Express Next Day Delivery is available on most of these products. Please Call 01539 760650 for more information and additional costs. Free 3-5 Working Days Delivery is available for larger products which have to be palleted. Express Next Day Delivery is available on most of these products. Please Call 01539 760650 for more information and additional costs. Free 14-21 Working Days Delivery is available for special order products which are not a stocked item with ourselves. 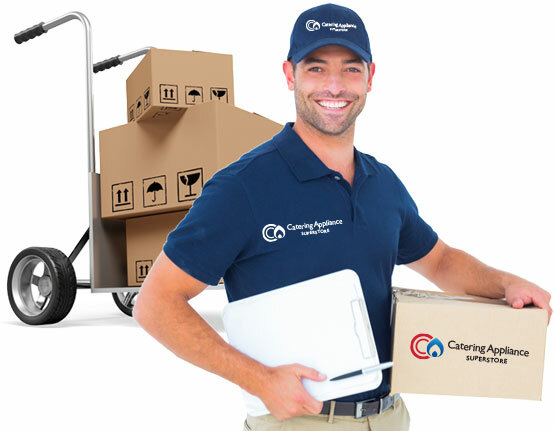 Orders will be sent for "Express Next Working Day Delivery" within the UK mainland, subject to an Order (with the relevant delivery charge) being accepted by Catering Appliance before the advertised cut-off times, and providing no additional security checks are required and the goods are available. If the Order cannot be delivered 'Next Day' then delivery will usually be completed within 2-3 working days. Other regions outside of UK Mainland (including some areas of the Scottish Highlands) are subject to additional costs and may not be subject to next working day delivery. Offshore/Remote deliveries will be despatched immediately however the actual delivery time will vary depending on the delivery location. We will contact you if your delivery address is subject to additional charges. Whether you're ordering a large double door freezer, a commercial oven or a back bar cooler, you need to make sure there's adequate space to install your unit and access for them to be delivered. Please watch this helpful video before placing your order.